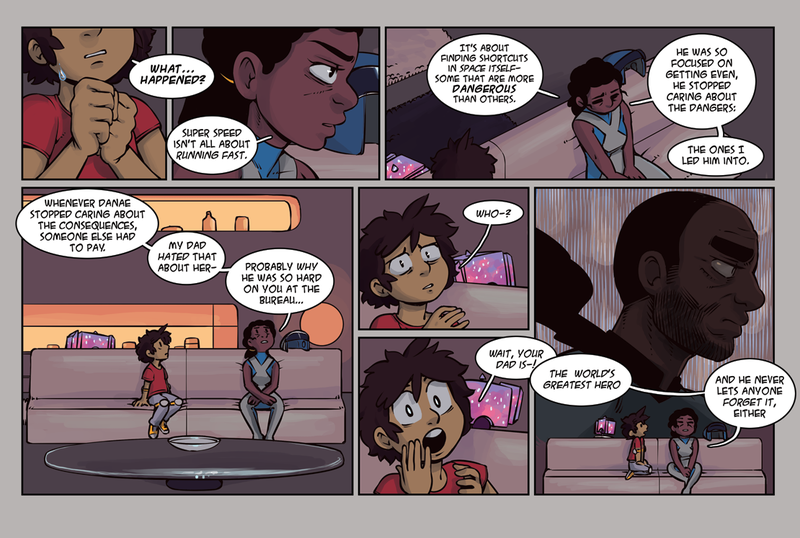 Now seems like a good time to lay down how a few things work in the StarHammer universe. Super speed isn't actually about the speedster running as fast as they can. Although I'd be lying if I told you it didn't help. Speedsters are able to move faster than the average person because they're able to pass through spatial shortcuts. They all do it a little differently. Jamie is able to resonate at a certain frequency that allows her to open streamlike passages that she then runs through to get where she wants to go. She practices running so she can max out that ability as the faster she runs through those passages the faster she gets to her destination. Mean Streak was able to detect where shortcuts were and step through them as if he found a system of hidden hallways between locations. There's other speedsters like Fast Loris, a Swedish teenager whose Strepsirrhini-like limbs are able to force open shortcuts in space. I'm sure we'll be able to fit in a visual about all of this somewhere in the actual comic. Anyway, this is the second to last page of Chapter 4. We have one more page and then a holiday illustration and afterwards we go on break. During that break we'd like to post work by our readers. So if you're interested in submitting a guest comic or illustration we'd be happy to have you on board. Just contact us at star.team.go@gmail.com.